Lydgate Tunnel was constructed under the superintendence of Mr J G Fraser, acting for Messrs Locke & Errington, the engineers to the railway. It was driven through the coal measures. Faults are common in this formation, and several were met with in the course of the work. One of these presented itself in a singular manner, one-half of the tunnel being in strong shale and rock in veins, whilst the other half was in a mass of wet and loose shale. The work was commenced in August 1854, and completed in March 1856, over a period of seventeen months. Five shafts, 9 feet diameter in the clear, were sunk in the usual manner, excavating through soft material, and drilling and blasting through rock. After attaining the average depth of 60 feet, the material was raised by steam power. Four shafts, about 230 yards apart, were permanent for ventilation. Lydgate Tunnel's stone-built east portal. No.1A had formerly been a colliery shaft, and had not been used for many years. It was reopened by the contractor, and a cross heading was driven from it into the tunnel, the centre of which was 40 feet distant. 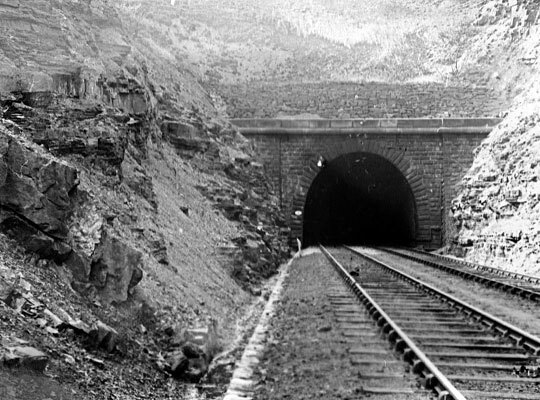 The permanent shafts were lined with 9-inch brickwork, or 12 inches of masonry, except where in rock; they were finished at the soffit of the tunnel with ashlar curbs 2 feet 3 inches deep. 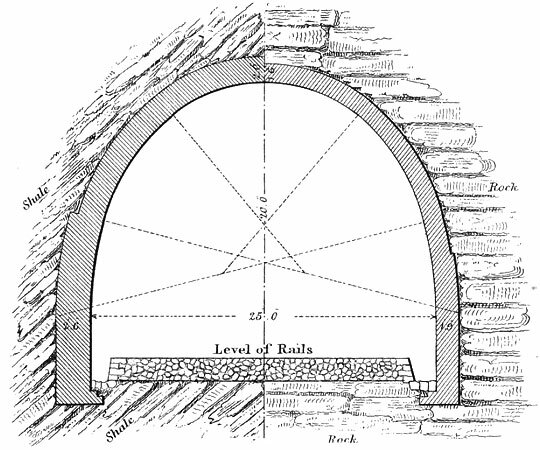 Where water penetrated, iron shields, with a gutter round the edge, were suspended, and the water conveyed by a pipe down the side of the tunnel, into the regular channels. The shafts were carried 12 feet above the surface of the ground, and were completed with an ashlar coping. A 9-horse power steam engine was fixed at shaft No.1a, a locomotive engine between shafts Nos. 1 and 2, to work them both, and another locomotive between shafts Nos. 3 and 4. Much inconvenience arising from foul air was checked by the proximity of the shafts. Foul air was driven away by means of fans fixed on the surface, which forced down a volume of air through pipes, which were fastened along the tunnel. In the neighbourhood of the old coal-workings, which ran across the tunnel, much choke-damp was met with, which was counteracted by a current of fresh air forced down through a bore-hole from the surface, lined with an iron pipe. Great care had to be exercised in fixing the centres througl the portion of the tunnel lined from the heading of No.1A shaft, 245 lineal yards in extent, as part was on a curve and part on a straight line. 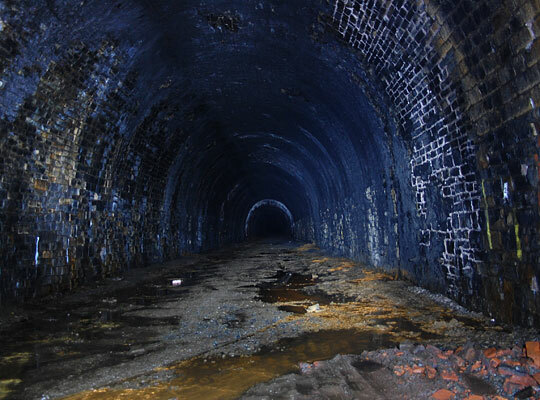 A general view through the now-disused tunnel. The excavation was conducted in the usual manner - the rock and strong shale being blasted out, and the clay and loose shale axed out. As each length was headed it was widened out, and the roof and sides supported by larch bars and poling boards, from 9 to 10 feet above the formation level. The material was removed in iron skips, capable of holding half a cubic yard each, which were placed on light trolleys, and these pushed along tramways laid between the work and the shafts, raised to the surface by engine power, and tipped on the spoil bank. The lengths mined averaged: in loose shale, 12 feet; strong shale, 15 feet; rock, 24 feet, in some instances 30 feet. The centres consisted of skeleton ribs placed about 4 feet apart; at the leading end, two centres were placed close together, for greater security. A cross section showing the thickness of the lining through shale (left) and rock (right). The sidewalls were built of coursed rubble, the beds of the stones being punched with a hammer. The footings were not less than 18 inches below the formation level, and the walls were carried 7 feet 3 inches above the level of the rails. The arch, for 632 lineal yards, was turned with fitted rubble; and from the scarcity of good bedded stone, 700 yards were of brickwork. The mortar was composed of barrow-stone lime mixed with coal ashes, in the proportion of 2 to 1, ground by heavy iron rollers, and used fresh. Its setting power was most satisfactory. Where the crown bars sagged much, they were built in, the intermediate spaces being filled with brickwork. Where water was met with over the crown of the arch, the tunnel was covered with zinc, terminating in a gutter to convey the water where a pipe was built through the masonry, to be discharged into the drains. The contract price for excavation, without distinction, was 4s 6d per cubic yard, including all the timbering. The prices paid to the miners varied from 8l to 18l per lineal yard, according to the material; nearly half the total length of the tunnel amounting to 12l per lineal yard, or less. 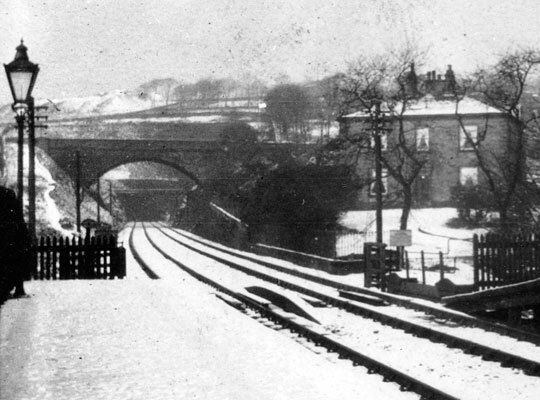 The view towards the tunnel's east portal from the platform of Grasscroft Station. The price for setting the centres was 8s per rib. The contract price for the tunnel through rock was 26l per lineal yard and through shale 35l 16s per lineal yard; the average price was 30l per lineal yard.